The reality can be seen through different "glasses". Depending on the tool you take you'll have different views and insights. And there are other perspectives to tackle the tasks and to solve them. 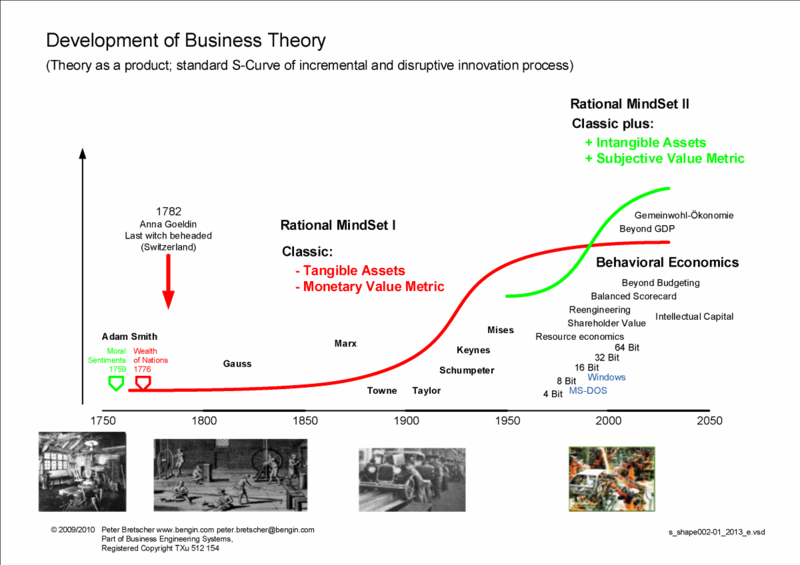 Increasingly, it is found that many of the insights and tools of classical economic theory - with over 200 years old roots - no longer meets the needs for a rationale design of today's economy. Insede brings the necessary innovation in the economic models. "Actually, there are other criteria we should use for corporate planning. But we have by law the Financial Accounting as a planning tool. And two different systems, we can not afford." The first two priorities bring (1.) 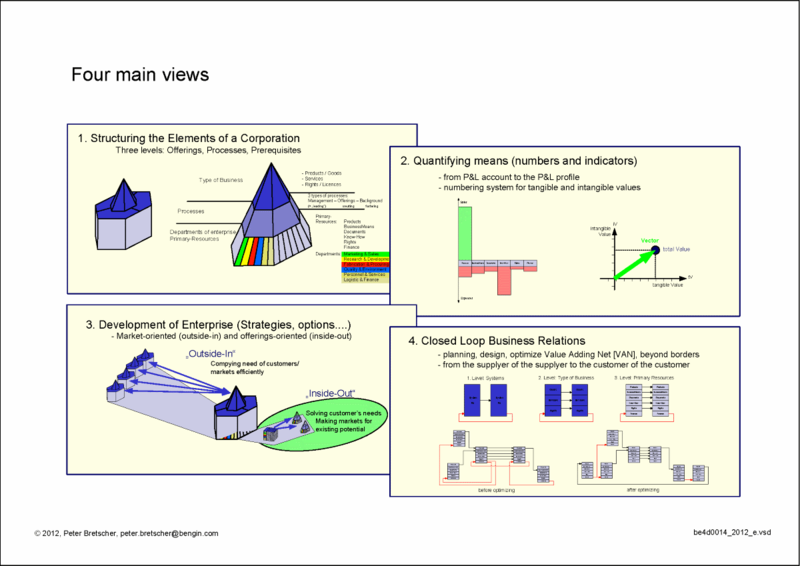 an enterprise model with three levels (Offers - Processes - Requirements) and in the area of ​​quantitative indicators (2. 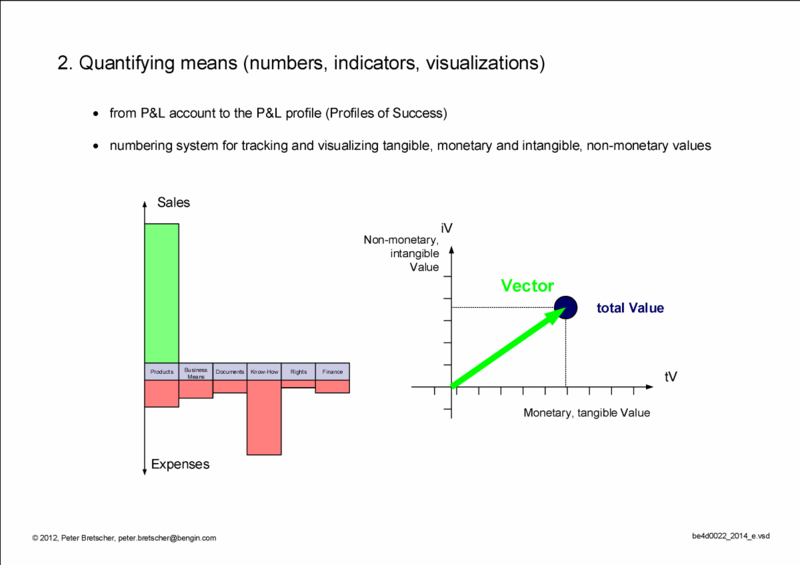 ), the "success profile" and the "vector metric", which shows also correlations quickly understandable. Target three and four then expand the strategic options in a previously not representable (and communicable) way. New enterprise 3D model. 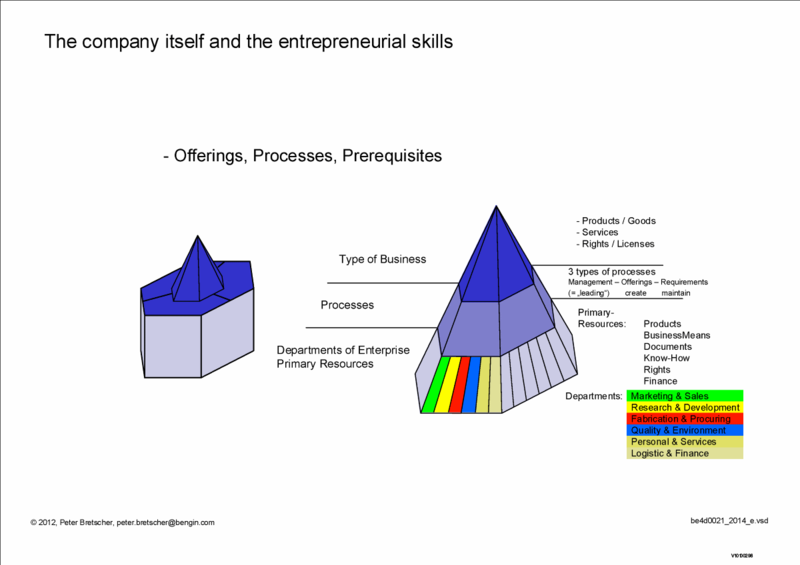 Three levels: Offerings - Processes - Resources. Integrates tangible AND intangible resources. Who is not afraid of transparency, can discover new opportunities. 3D models give more transparency about the structure of the company. About the primary resources that need to be present for the processes that are required to produce the offerings (Products, Services, Rights/Licenses). Because not all of the important properties of the goods can be detected with monetary indicators, indicators are presented here, extend the existing linear paradigms. New visualizations facilitate the understanding of the relationships between business, politics and society, and allow sustainable solutions. The one who looks only on the markets is always late. Good is, if you know the tangible and intangible resources and potential. So you can quickly develop new solutions to real needs (tangible AND intangible) of potential customers and create new markets. 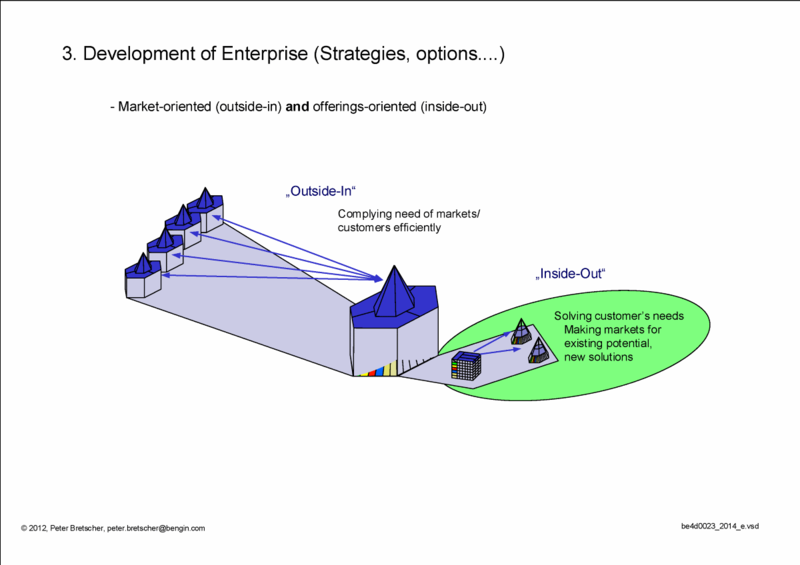 Real world solution is a "Hybrid-Strategy". From the supplier's supplier to the customer's customer. 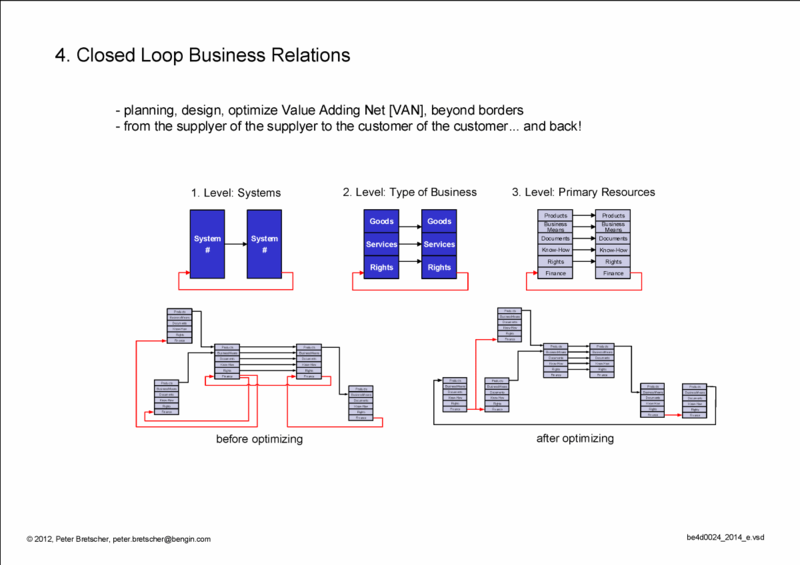 The transparent optimization of the offerings and compensations (monetary and non-monetary) helps in networked control loops to design new business options that can not be overlooked with the old instruments. Also helpful if there are monetary and non-monetary international trade restrictions.